I’ve wrote an article about the new graphics platform for Chromium called Ozone-GBM. I particularly think that Ozone-GBM will play an important role next in Chromium and Linux graphics communities in general. I hope you enjoy the read :) Please share it. A few weeks ago we released Ozone-Wayland and now we’d like to detail for you the development process and strategy behind it… ah, and the title is not developing Chromium, the browser; it’s developing Chromium, the project! You will understand why next. There are three main projects involved in here: Chromium, Wayland and Ozone-Wayland. 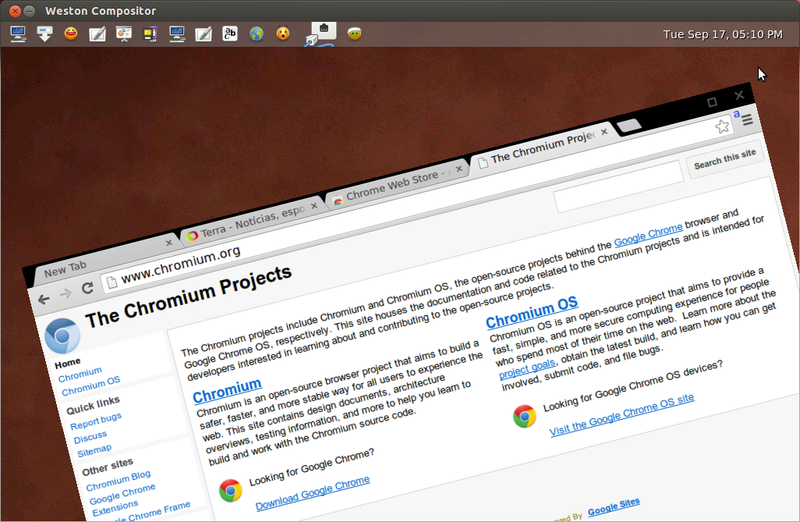 In Chromium, there is a very big and geek community that mainly produces Chrome browser and Chrome-OS. Very near to that one there’s Blink engine’s community, which interacts (and overlaps) a lot with the Chromium’s; I can’t tell exactly in numbers but there’s huge number of people, vendors and commercial involved in Chromium and, more important to us, there’s a lot of quality code being cooked in there for leveraging Web technologies in general. In the other side, we have Wayland, the project that hosts the development of a Linux graphics system. Its goal is to give to applications the best graphics performance that can be extracted from the hardware. The community in there mainly produces the Wayland client/server libraries and Weston, the window server to hosts applications. Now, somewhere in between Wayland’s and Chromium’s, the Ozone-Wayland community will start to grow. Ozone, the Chromium’s meta-platform for supporting different windowing systems, has given the possibility of building the whole Wayland support outside the Chromium and Wayland code-bases — basically each project then has its own code base. It may take a second of reflexion, but it’s an wonderful way of organizing the development because a community doesn’t need to step on the other. And that’s the main point because, grossly speaking, Web developers don’t want know core graphics and hardware details, while the window system’s don’t want to know about Web technologies. Using this kind of organization, Ozone-Wayland therefore hosts the tough task of bridging Wayland graphics for Chromium, and on doing so also diminishes the burden of the two other big communities having to interact directly with each other. – Chromium: Blink Web engine, Content Shell (used for runtime’s, browsers, etc), Chrome browser, Ash UI, Chrome-OS, among others. – Wayland: libwayland-server, libwayland-client, Weston window compositor, Desktop Shell (a “toy” shell UI, for testing purposes). – Ozone-Wayland: libozone-wayland, that relying on libwayland-client and linking with all Chromium based products. So Ozone-Wayland basically leverage any of those products that the Chromium project develops. A few people came asking me how to setup Ozone-Wayland and etc. I’m not sure you guys noticed, but we’re hosting there in Github something that we call our “Web page”, detailing a bit more how Chromium code-base plays together with the Wayland specific bits. In particular, there’s a how-to for people that wants to give a try and check out the development. There’s a small wiki as well. So you can “star” and “watch” Ozone-Wayland, as a subscription mechanism to get notifications of all sort of updates. Do it now! Ozone is a set of C++ classes in Chromium for abstracting different window systems on Linux. It provides abstraction for the construction of accelerated surfaces underlying Aura UI framework, input devices assignment and event handling. Today we are launching publicly Ozone-Wayland, which is the implementation of Chromium’s Ozone for supporting Wayland graphics system. Different projects based on Chromium/Blink like the Chrome browser, ChromeOS, among others can be enabled now using Wayland. In particular, we have Chrome Browser and Content Shell enabled and running on Wayland. All the projects are under active development (therefore unstable) but we are hoping to cope with fixes together with the open source community. We’ll be posting updates in the following weeks detailing the solution and our ideas. Enjoy! ...my name is Tiago Vignatti. I'm a computer scientist and open-source technologist. Ex-Nokia, Ex-Intel, nowadays I am the CTO at Imersys, developing Virtual Reality, Augmented Reality and Mixed Reality systems. I hope you'll find my blog interesting. I can be reached here. You can see more about me here. Have fun!